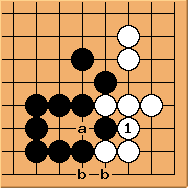 a and b are two point gote plays for either white or black. 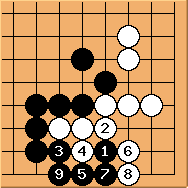 One point better for Black, but White has sente. 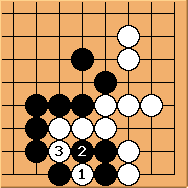 But of course, if Black leaves - - unplayed, then he can come back to take two points in gote endgame later. unkx80: I shall count the value of the sequence up to , assuming that the territories are defined by the marked stones. 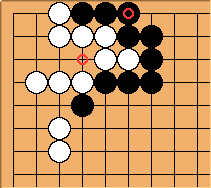 Comparing it with the endgame clamp diagram, White has one extra point of territory but Black has captured one more stone than White. BillSpight: Indeed that is so. It might be interesting to compare it with the solid connection in a DifferenceGame: ClampConnectionComparison. It's interesting to note that this , which seems more severe, is one point worse, and loses sente! Black pushing at , instead of , is one more point worse off (If I've read correctly). DieterVerhofstadt writes: Morten, this is called synchronicity. I was about to make exactly the same comment ! 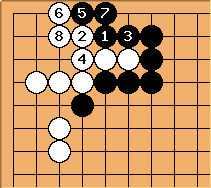 Either Black has sente or there is an extra reduction at a, resulting in a large ko for both or another loss for White. But White sacrifices a stone. 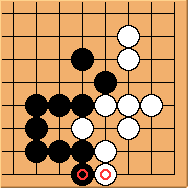 Again: same result, one point worse off and loss of sente. BillSpight: Looks can deceive. The clamp is gote. unkx80: You are not wrong, but you have to take into account the actual situation. Most Chinese Go books written by professional players say that the clamp is sente. The above is based on an assumption that both parties complete all sequence of play. If playing elsewere is considered, then no one knows who can get sente (at lease in theory). It is because even can be ignored if W can find a bigger value elsewhere to offset the loss of not responding to . Bill: aLegendWai, you are using the terms, sente and gote in a different sense than they are used on the rest of this page. When we say that a play or position is sente or gote, without reference to other plays, we are using the sense used in evaluating positions and plays. In that sense, the clamp, - , is gote. 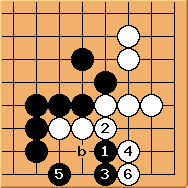 There is theory behind this usage, and because of that theory we can predict that correct play will usually be gote for this position. protects the corner. That reduces the local temperature. White should view the marked stones lightly. Later is sente. Later the following is Black's sente. is tesuji. 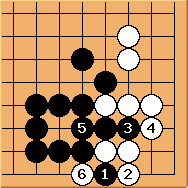 If Black starts with , he loses sente. MartijnWallage?, 1k: Well, if sente is so important. White can play and then is not sente any more. But sente can't be so important since in the "Sente" diagram Black doesn't gain anything. Bill: Indeed, after - , is not sente. In fact, it is an ambiguous move. For evaluation purposes we can treat it as White's sente. If we compare this with the sente diagram, we see that White is 2/3 of a point worse off here, and - is still sente. As for a sente not gaining anything (on average), that is the nature of a sente-gote position: sente gains nothing. How large is the sente? 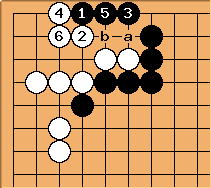 If White plays the reverse sente at , now a and b are miai. 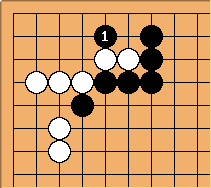 This position is 2 1/3 point better for White than if Black takes his sente, so the sente is worth 2 1/3 points. If Black plays gote he picks up only 1 2/3 points. 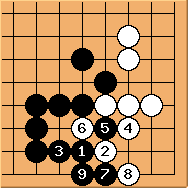 So if Black does not play his sente, White will play the reverse sente (as a rule). If the ambient temperature is less than 2 1/3, that represents a loss for Black. 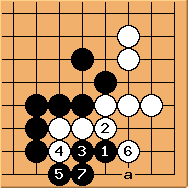 tapir: If it ends in gote after the drop in temperatur (with the defending players answer) - is the clamp really better than the monkey jump - which is at least sente? isn't it usually a sequence to be considered en bloque only when temperature temporarily increases during the sequence? It's interesting to note that this , which seems more severe, is one point worse, and loses sente! " You'll notice black still has sente. 1 point can be worth still having that, and I didn't quite get that part about playing at b instead of 1. I mean I did, but not how it is worth more.